The thought of hunting Aoudad (Barbary sheep) has fascinated me for years. Originally from the mountains of northern Africa along the Barbary Coast (hence the name), they were introduced into Texas several years ago. Originally intended for high fenced hunts for exotics along with many other exotics such as axis deer, gemsbok, oryx, black buck and many others, the Texas and New Mexico climate and terrain were ideal for animals that escaped or were turned loose and prospered in the desert and mountains. One of the places was the Chinanti Mountains on the La Escalera Ranch (over 400 square miles) near Ft. Stockton, Texas. (I was fortunate enough to hunt on that huge ranch a couple of years ago and take an Aoudad). I saw my first Aoudad in the wild, while working on the King Ranch west Texas division called the U Ranch at Balamoreaha, Texas back in 1973. While they are endangered in their home country, Texas has an over abundance with no bag limit on them and the season runs year round. A Texas non-resident 5 day hunting license is only $48.00 and entitles you to take as many as the ranch you are hunting allows or what your pocketbook can stand. Many of the ranches have found that hunters were willing to pay good money for Aoudad hunts and a guided hunt usually runs around $3000 to $3500 for one animal. 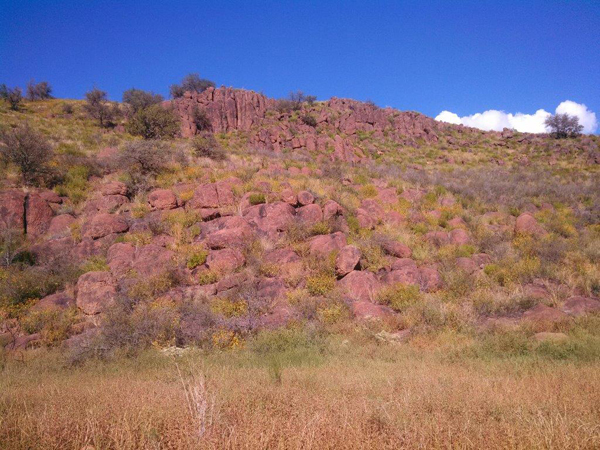 Can you guess how many Aoudad are scattered across this cliff side? They are a very agile mountain dweller that is able to get enough moisture from the browse they eat to survive. If regular water is available, they will go to it, sometimes wallowing in the mud like an elk. A brownish tan color, they blend into the mountainous terrain very well. There are actually nine Aoudad scattered across the picture above. They are lighter colored when they are young and darken as they age. One of the neatest things I have liked about the Aoudad rams is the long hair that extends from under their throat down the chest and spreads out to the knees (called chaps) with a small mane on top their neck. The horns curve out, back and down with both sexes having horns but the rams horns are heavier than the ewes. Rams can get in the 300+ pound bracket with horns over 30 inches. They are really heavy in the shoulder area and lighter weight in the hips. You will find family groups composed of ewes, lambs and younger rams while the older rams will be in bachelor groups except during the rut, usually around September thru November, when you will find larger rams with the ewes. They can breed year round though. Most hunting of Aoudad consists of a lot of miles traveled and a lot of glassing the rugged terrain. Usually laying up during the heat of the day, they are basically active in early morning and late afternoon. If there is water available, they are sometimes found traveling to water at mid-day. Normally they are found on the side of the mountains or on top but may be spotted either traveling to water or another mountain. They seem to have a tendency to stand up and look down at anything that attracts their attention, often silhouetting themselves. They are notorious for being a hard animal to put down and keep down, so don’t be surprised if your guide will either have a dog to track down a wounded animal or will put a backup shot in the animal that looks as if it is going to make tracks, or both. They will tell you to keep putting bullets into the animal as long as it is moving. Mounted, they make a very impressive trophy, especially if they are mounted where you can see the flowing hair on the neck and legs. Aoudad have been taken with a variety of calibers. I shot the Aoudad pictured above near Ft. Davis, Texas, using a Remington 700 in 7mm Remington Magnum with the Sierra 150 gr. GameKing #1913. The #1913 gives good penetration and excellent performance on Aoudad and has worked flawlessly for the last two I shot. If you want an interesting hunt, I can definitely recommend an Aoudad hunt. 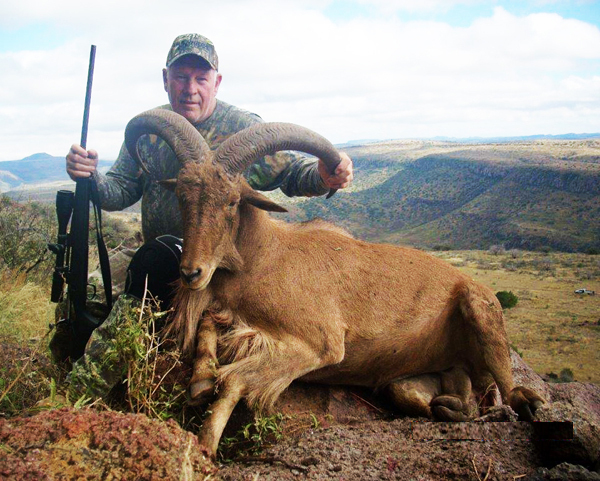 This entry was posted in Hunting Stories and tagged aoudad, Aoudad hunting, barbary sheep, ewes, rams, Texas aoudad, Texas hunting. Bookmark the permalink. Great going , lots of exotic animals here in New Zealand , Fallow , Red , Seka, Wapiti , and the best, millions of rabbits. Come on over but bring a varmint rifle and lots of ammo . Hopefully returning to the USA full time in the near future .